We’ve talked about organic cleaning products that you can find in nature and also about simple homemade cleaning products that use everyday items around your house. These are both great ways to be both frugal and go green in the process. Today we’re going to talk about cleaning products that you can make at home, again using everyday items around your house. And if you don’t have these items around, don’t worry! For the most part, they’re very inexpensive which also makes this a budget friendly way to clean. To clean your bathtub, pour 1/2 cup baking soda into a medium bowl. Add liquid detergent and stir until it becomes the consistency of frosting. Put a spoonful onto a sponge, wet it slightly, clean your bathtub and then rinse it. You will find this cleaner does not leave a gritty feel in the bathtub. You can make just enough for the job or you can add a teaspoon of vegetable glycerin to keep the cleaner moist. Store it in a tightly sealed jar. To clean general surfaces, put 1/2 teaspoon washing soda with a small amount of liquid soap in an empty spray bottle. Add 2 cups of hot tap water. Shake the bottle to incorporate the washing soda until it has fully dissolved. Squirt the liquid on the surface and then wipe it off with a rag or a sponge. To clean stuck-on food in the bottom of the oven, sprinkle water over the food. Cover the moist food with enough baking soda that the bottom of the oven looks white. Add more water over the top of the baking soda and allow the mixture to rest overnight. The next day, wipe out the mess that has loosened. To remove anything that remains, put a little bit of liquid detergent on a wet sponge and finish washing the oven. To clean your windows, mix together 1/4 to 1/2 teaspoon liquid detergent, 3 tablespoons vinegar and 2 cups of water in a spray bottle. Shake the bottle and then spray it on your windows. Use a wadded-up piece of newspaper to wipe the spray from the window. You can also add a drop or two of your favorite essential oil to cover the scent of the vinegar. These four recipes can be used for most of your cleaning needs. However, you can also use each ingredient for cleaning on its own. 1/2 cup of straight vinegar in your rinse cycle softens clothes. (Please note: you do NOT want to use vinegar on marble surfaces.) Baking soda deodorizes. Sprinkle baking soda on your carpet before vacuuming to remove odors. And don’t forget to follow Just Another Mom on Twitter for more frugal and green living tips. 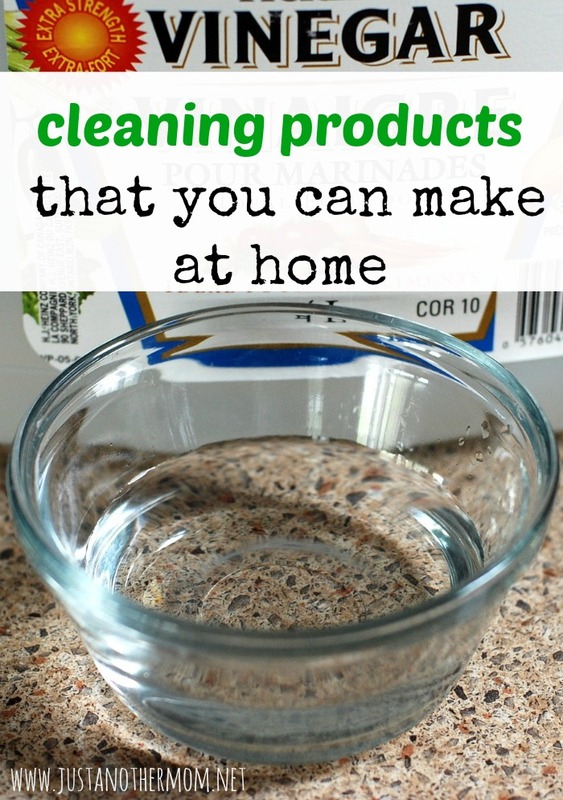 Chemical free cleaning products are so important! I’m a big fan of baking soda and vinegar. Absolutely! Especially when you can make them yourself. It really does save in the long run.